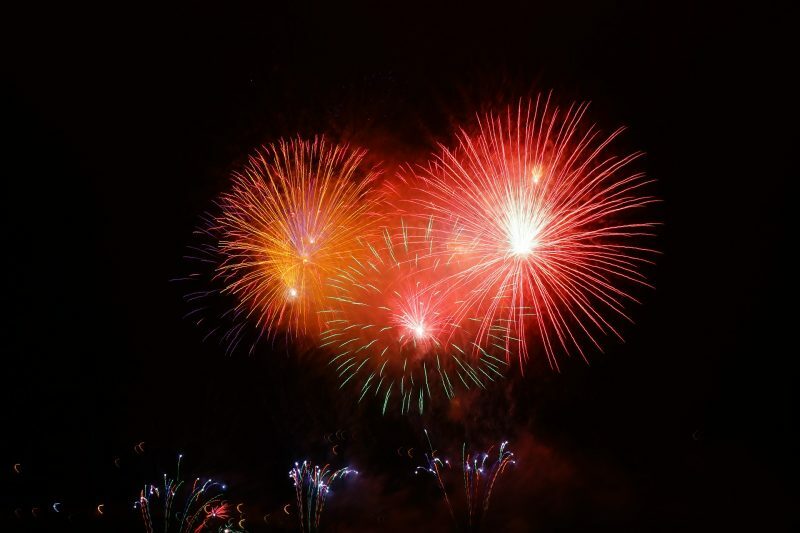 While you’re on your family vacation to Amelia Island during the month of July, you won’t want to miss out on some of the incredible fireworks display viewing opportunities that the area has to offer. Many of the options are located near your beach condo rental, and you can choose from cruises, viewing points in downtown Fernandina Beach, and other options. Where are the most promising places to see the many Amelia Island fireworks? Some of the choices on where to experience the light displays may even take you on adventures you hadn’t considered previously. One memorable way to experience the fireworks offered on Amelia Island is to do so from on the water. Fireworks cruises in the surrounding waters provide the perfect opportunity to do just that. Watch the colorful show by picking one of two special sunset cruises that are offered by Amelia River Cruises. An adult BYOB cruise allows you to bring along your favorite drink while listening to local music aboard your watercraft. The cruise is meant to keep you relaxed and happy as you’re whisked out to the middle of the ocean off Amelia Island to enjoy the fireworks. There’s also a family-friendly version of this cruise, taking adventurers of all ages onto the water for the show. It gives a history of the area as well as offering more open views of the booming fireworks. Both options depart from the downtown marina at 8 p.m. and return shortly after the fireworks show around 10 p.m. on the 4th of July. For either of these cruises, you’ll want to make sure to book your spot in advance, as they do fill up fast. This event is put on by Light up Amelia and the Community First Credit Union. The whole thing is a family-friendly and amazing Fourth of July celebration. Head on down to Downtown Fernandina Beach to participate in the patriotism. You’ll be able to enjoy live music, an interactive kid’s zone, and vendors. On top of that, there will be several patriotic contests for you to get involved in and really get into the spirit of the holiday. These include Most Patriotic Pet, Best Decorated Bicycle, a Pie Eating Contest, and the Uncle Sam Lookalike Contest. All of these events start around 6:00 p.m. and last throughout the evening. The entire day is topped off with a grand fireworks display that booms into the sky at 9:15 p.m. This All-American Independence Day celebration takes place among the beautiful background of the Atlantic Ocean. Relax for the evening on the Ritz-Carlton’s gorgeous oceanfront lawn as you take it all in. The celebration kicks off on the Fourth of July at 7 p.m. with live music. You’ll also be treated to a buffet of local meat and seafood that are grilled and smoked to perfection, along with salad and desserts to round out the meal. The annual fireworks show gets underway after all of the excitement. The display kicks off just after 9 p.m. and is set to patriotic music. You’ll want to get to the Ritz-Carlton early to get the best spot, and definitely reserve your spot by purchasing tickets ahead of time. Tickets for this event are $99 for adults and $29 for children. Whichever selection you choose, you are sure to be impressed by the displays of beautiful explosions that go off around Amelia Island. Be sure to check out our top-of-the-line Amelia Island vacation rentals.